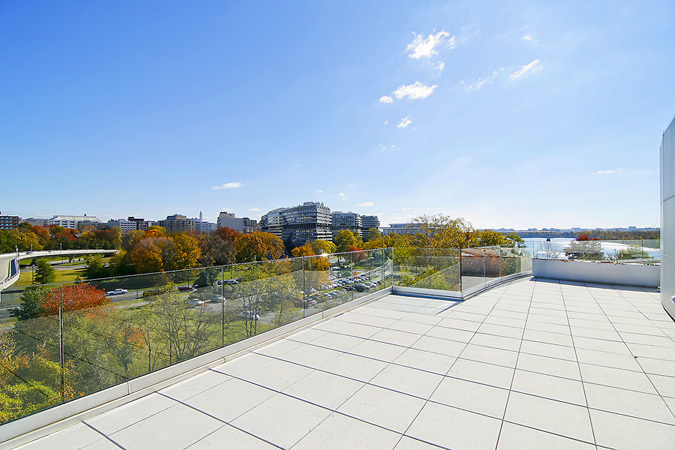 One of only seven units is for sale at DC’s ultra-exclusive “Harbourside”, the boutique building known for its prominent location next to the renowned House of Sweden on the Potomac River in Georgetown. The price? $4.1 million. The 4,800 square foot penthouse spreads out over two floors of superbly appointed living space and offers one of DC’s largest private roof decks, arguably larger than most apartments themselves. The terrace’s glass panel railing makes this property decidedly modern only adding to the open feeling and the smashing views. The property traded for cash last time it sold, a mere $3.1 million. Recently it was rented for $11,000, barely twice the monthly condo fee.